Prognostic significance of serum calcium level in patients with intracerebral hemorrhage is not well studied. The aim of the study was to identify if a relationship between admission serum calcium level and prognosis exists in patients with intracerebral hemorrhage. A total of 1262 confirmed intracerebral hemorrhage patients were included. Demographic data, medical history, medicine history, laboratory data, imaging data, clinical score, and progress note were collected from their medical records. All images of head computed tomography were reanalyzed. 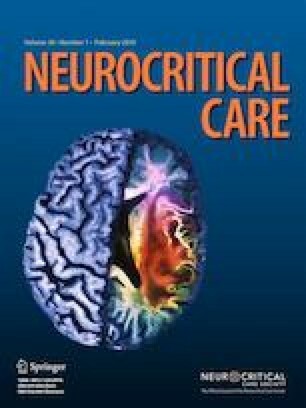 Ninety-day prognosis was recorded, and poor outcome was defined as death or major disability caused by intracerebral hemorrhage. During the 90-day follow-up period, 504 patients died and 226 patients suffered from major disability. Death and major disability were combined as poor prognosis. The remaining 532 patients showed good prognosis. Admission serum calcium level was lower in the patients with poor prognosis than in the patients with good prognosis (2.41 ± 0.23 mmol/l, 2.55 ± 0.26 mmol/l, P < 0.001). Admission INR and hematoma volume were higher in the patients with poor prognosis than in the patients with good prognosis (INR: 1.74 ± 0.29, 1.70 ± 0.29, P = 0.029; hematoma volume: 11.6 ± 4.4 ml, 10.7 ± 4.1 ml, P < 0.001). There was no difference in admission APTT level between the two prognosis groups (28.4 ± 5.6 s, 27.8 ± 5.4 s, P = 0.056). A multivariate COX regression analysis reported that admission serum calcium level ≤ 2.41 mmol/l was associated with the increased risk of poor prognosis (death or major disability) in the patients (HR 1.45, 95% CI 1.32–1.60). In addition, there was a significant linear association of serum calcium level with coagulation function markers and hematoma volume on admission (APTT: r = − 0.091, P = 0.001; INR: r = − 0.063, P = 0.025; hematoma volume: r = −0.108, P < 0.001). Admission serum calcium level might be a prognostic marker for intracerebral hemorrhage. Potential mechanism involved calcium-induced coagulation function abnormality. LT, XL, TL, XY, YR, QZ, HY, XQ, Q W, TT, and JT were involved in study concept and design, acquisition of data, analysis and interpretation of data, and preparation of the manuscript. The study was supported by the Natural Science Foundation of China (81560201).The study was supported by the Doctor Foundation of Guizhou Provincial People’s Hospital (GZSYBS03).